Continued from the previous post, I'd like to write a few thing about the Tsurigama. 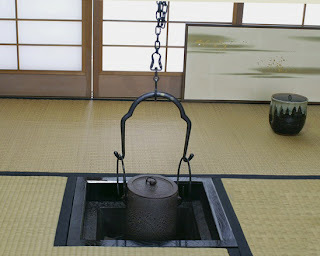 The Tsurigama or hanging kettle is a rare item usually used just before the Ro sunken hearth is closed to welcome the Furo for the summer season. The Tsurigama is a slightly narrower kettle which is hung from a chain exactly above the Ro charcoal pit. The Kan rings are different from those used when removing a normal Kama from the fire. The chain, the rings, and the handle are available fro reasonable prizes to extremely expensive sets with a name made by famous smiths and come in their own box. Using it during Temae is not very different from a normal Kama except when the charcoal is changed. Then we need a few extra movements to be able to remove hanging kettle from the chain and place the Kama on the Kamashiki. 1. Prior to take kama of the chain and move to left on kami-kamashiki, Left hands holds the metal support from under in the center while Right hand moves the hook with three chain rings higher. This is to lift kama and not damage robuchi during the following movements. 2. Holding with Lef hand at center top andRight hand on the side, kama is moved on kama-kamashiki paper. While Left hand holds the support, first the right, then the left Kan are removed and rest on Kama while the connecting piece is moved to left (on tatami or against the left wall). 3. After moving Kama the Host turns to Ro and lifts the chaing 5 more rings to provide unrestricted access to adding Shimesibai, Sumi and purifying the robuchi. 4. When all is completed, prior to bringing back the kama, the chain is lowered 5 rings.